In the standard IEPE version, each vibration channel operates within 2 simultaneously running frequency bands. The bands are configurable from 0.7 Hz up to 11.5 kHz and will typically monitor the 10-1000 Hz area (ISO 10816-3), as well as the high frequency area 2-10 kHz, where roller bearing resonances are detected. PCH 1420 uses several bearing fault detectors simultaneously, in order to detect faults as early as possible. 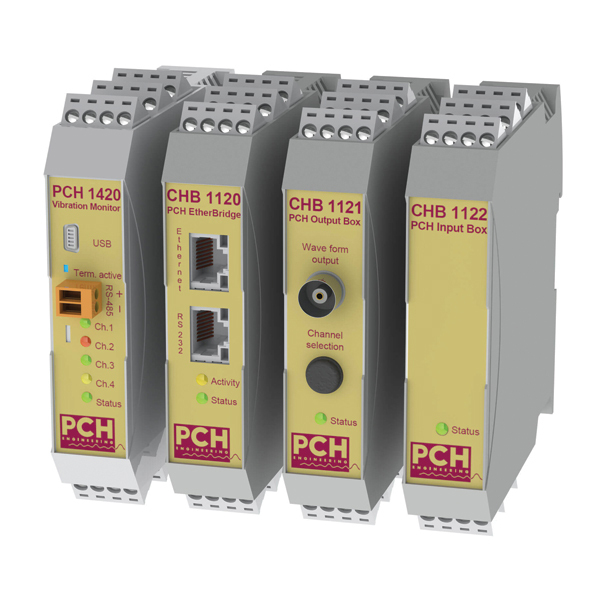 Thus PCH 1420 offers both broadband high frequency monitoring, Envelope, Kurtosis and Crest factor for bearing fault detection. All detectors are running simultaneously and are based upon inputs from up to 4 measuring points in real-time. PCH 1420 supports various vibration sensors, like IEPE, 3-wire API678 accelerometer, proximity probes, velocity sensors as well as PCH Low Frequency accelerometers.